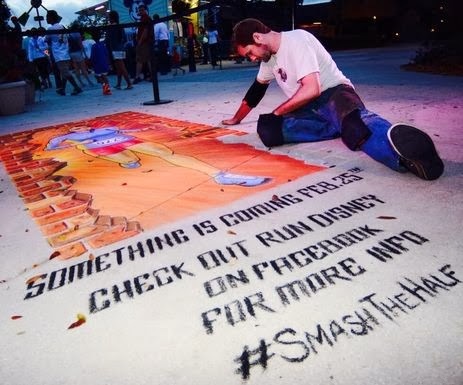 2014 Inaugural runDisney #Enchanted10K recap and #SmashTheHalf race announcement! Saturday morning marked my second runDisney 10K at Walt Disney World. The 10K distance is my favorite of all so when they incorporated them into the 2014 race series, I had to sign up. 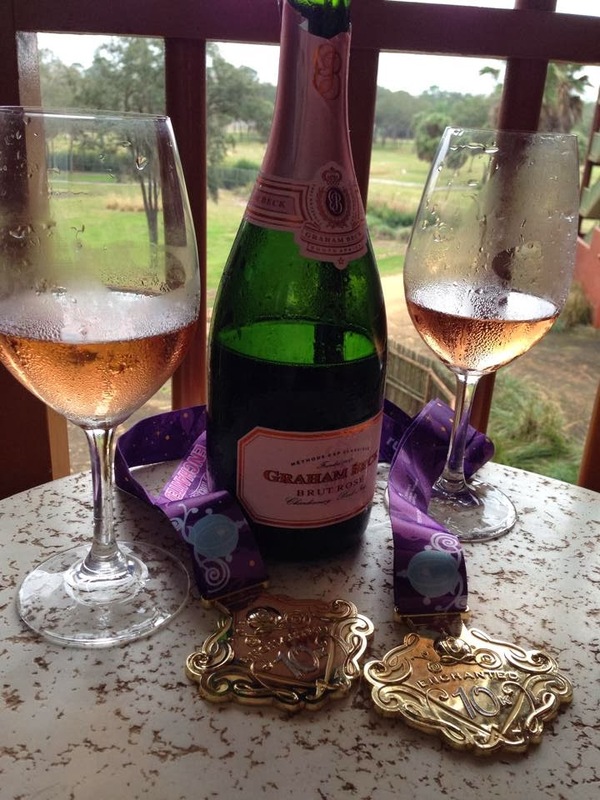 The Inaugural Enchanted 10K was part of the Inaugural Glass Slipper Challenge (two races in two days). I ran Glass Slipper Challenge with my best friend Keri and we dressed up as Minnie Mouse for this event. 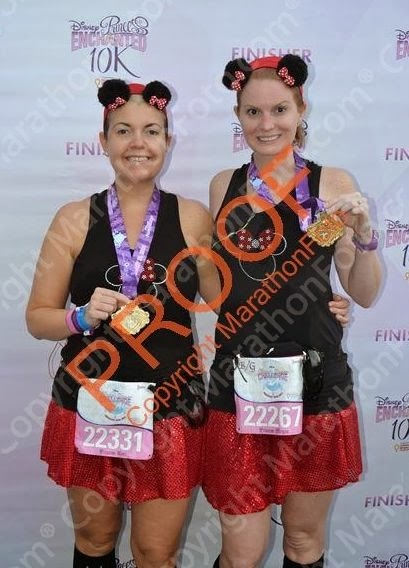 I have been Minnie Mouse on one day during each of the runDisney race weekends I have participated in (with the exception of Tower of Terror). Since we were fortunate to stay on property, a bus took us to Epcot and we didn't have the stress worries of traffic. The peace of mind was very well appreciated! Although we didn't have much time before the 10K started, I ran into so many friends! My friend Heidi (top left) and I met while working together many years ago in Palm Coast, FL. Now, we both live in Tampa and I am so proud that she has taken on this running journey. Pamela (top right) and I met on Instagram through our shared love or runDisney. We found out we were from the same town (Daytona Beach) but a few months ago, we found out we have the same cousin - talk about a small world! I ran into my running buddy Nicole and her boyfriend Chad (bottom left) right before we started - Chad wore a tutu and a tiara, love him! I ran into Christine (bottom right) who I met through Gabe and is now a good friend of ours. She ran her first full marathon last month at Disney and is officially hooked on runDisney. While I ran this exact course last month during the Dopey Challenge, it was Keri's first runDisney 10K. She hasn't ran a Disney 5K either, so it was her first time running through the worlds of Epcot, which she LOVED. The first 3 miles of the course are on the roadways but they go by very fast. Once you are inside of Epcot, there are so many photo opportunities and I really enjoy how peaceful Epcot is first thing in the morning. runDisney is truly a place to take in everything while running and not worry about your pace, just beware of those above mentioned Balloon ladies! I am never one to stress over my finishing time and like to enjoy everything about the race. This is why people pay the big bucks to run at Disney - the experience! While we took a ton of photos, we only stopped for one character - Jiminy Cricket. We waited in line about 10 minutes for this photo and I couldn't be happier. Since Keri and I have both ran so many runDisney races, we have photos with a lot of characters. I do try and stop for those who we haven't had a photo with and ones which are unique, that you don't see everyday at the parks - like Jiminy. Keri and I also took photos in every land - we joked that we ran through China to get to France for sunrise. Literally! Once we got out of France, the course took us into Boardwalk Disney. I sometimes assume that everyone goes to Disney as much as my family does. I forgot this was Keri's first time at Boardwalk and she about freaked when she saw the property. I need help convincing her to get an Annual Pass! It only took me a year to break down and get a seasonal - now 3 years later, we are premium passholders. I have a feeling this weekend may have helped the cause just a little! After we rounded the boardwalk portion, we were on the beach side. I will never be able to look at this part of Disney the same. This was around mile 25 of the Walt Disney World Full Marathon last month and I was quite delirious when I got to this portion! Very happy to share a non-delirious moment with Keri at this beautiful location. After we exited the beach, we quickly found our way to the finish line, collecting our first of three medals from the weekend. Overall, I really love the runDisney 10K. Once we left race retreat, we boarded the bus on our way back to the hotel. 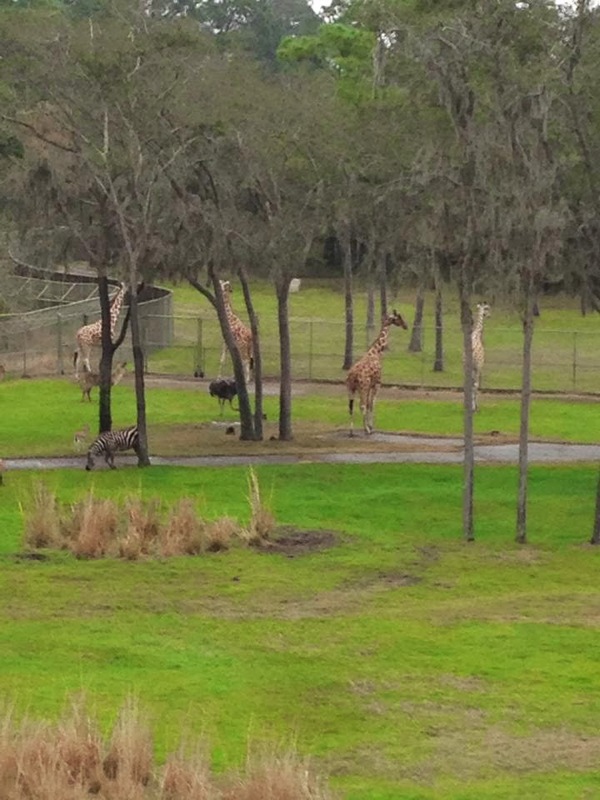 We stayed at Animal Kingdom Lodge and were greeted by giraffes and zebras upon our return! I cannot put into words how peaceful it was sitting on that balcony animal watching. 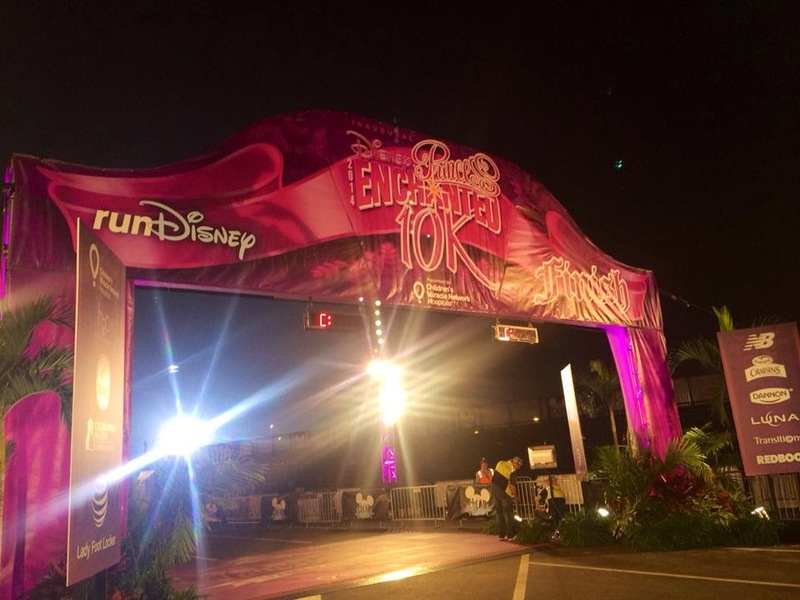 Congrats to everyone out there who completed the Inaugural runDisney Enchanted 10K this weekend! Also, make sure you are following runDisney on Facebook and Twitter. They will announce a new race event tomorrow morning at 8:35PST (click here for the Facebook Invite). I am pretty certain this race will take place in Disneyland as the announcement is in Pacific Time. The Hashtag is #SmashTheHalf and I want to make a wish on a lucky star that this will be a Marvel themed event. If it is an Avengers race, Gabe and I will absolutely be heading to California for this event. Stay tuned for more details which I will post tomorrow! I was so glad that I did the 10k. With only ever doing the 1/2 marathons at Disney this was new for me. I loved this course, it was so cool to have Epcot all to ourself & then to run around the boarwalk which I had never seen was great. Glad you talked me into the Glass Slipper Challenge. I was so happy to see you before the race! I love love love that 10K course. After the WDW10K so many people complained about it and I truly did not get it! I love everything about it. Even the first boring 3 miles. It is so quiet and peaceful and gives you that push to keep going because the best part is yet to come. The Tink 10K started in the parks and ended on the streets. I did not care for that. I like the parks being at the end of my race when I need visual stimulation the most to keep my mind off the running.